David Bowie, U2, the Cure, Iggy Pop and more take on the post-punk classic. On May 18, 1980, Ian Curtis, lead singer and chief songwriter of Joy Division, committed suicide by hanging. He was 23 years old. As post-punk’s premiere powerhouse, Joy Division were poised to embark on their first North American tour the very next day. Alas, on top of musical and business pressures, Curtis battled epilepsy and a crumbling marriage, thus prompting him to make the ultimate tragic choice. While nothing makes up for so heartbreaking a loss, Ian Curtis lives on through the continuing impact and influence of Joy Division in both music and our culture at large. 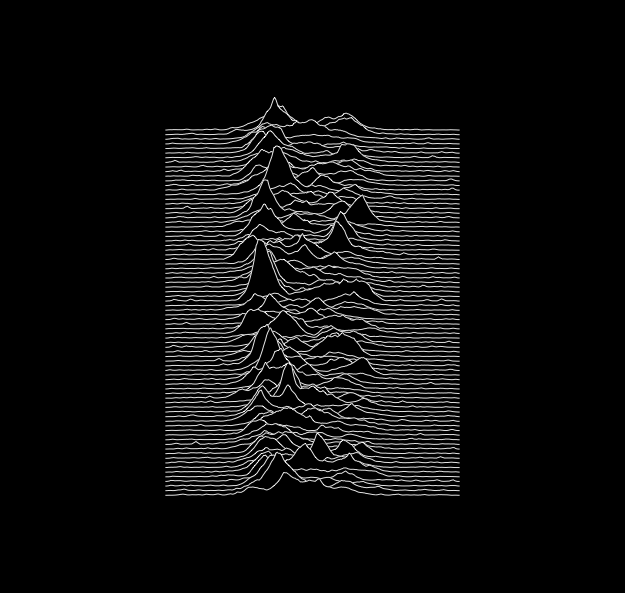 Even the cover art for their 1979 masterwork Unknown Pleasures—white radio pulses depicted against a stark black background—has become one of the great icons in all of rock in recent times, to the point that in 2012 Disney issued its own parody shirt! What “Satisfaction” is to the Rolling Stones, what “Stairway to Heaven” is to Led Zeppelin, “Love Will Tear Us Apart” is to Joy Division—as well as the new wave, goth, synth-pop, ambient, dark wave, EDM, and other forms of music to stem directly from its wake. Thirty-five years to the day that Ian Curtis left us, let’s celebrate his life and legacy with a playlist of other major musical luminaries honoring the man and his most famous work with their own versions of “Love Will Tear Us Apart.” It’s just one way that Joy Division has been able to keep us all together. In 1983, Joy Division bassist Peter Hook and guitarist/keyboardist Bernard Sumner happened upon David Bowie in a pub. The trio bonded over a few beers and, the next day, Bowie showed up at the practice space of New Order—Hook and Sumner’s current band—and they jammed out an impromptu “Love Will Tear Us Apart.” Although never officially released, they recorded the moment for posterity. Since at least the early 1990s, U2 routinely ended their hit “With or Without You” in concert by segueing into a bit of “Love Will Tear Us Apart.” At a 2006 show in Montreal, native Canadians Arcade Fire joined U2 for a full-blown cover jam of Joy Division’s classic. As the one post-punk goth-gloom UK band above all to rival Joy Division’s impact and influence, the Cure recorded their “Love Will Tear Us Apart” in Australia as part of a radio contest in 2000. It’s one for the gloriously downbeat ages. Fall Out Boy’s acoustic spin on “Love Will Tear Us Apart” appears on their 2004 EP, My Heart Will Always Be the B-Side to My Tongue. The track’s crisp production and a spirited performance really packs a punch. As a group, New Order has performed “Love Will Tear Us Apart” in concert countless times. On March 11, 2014, the band played the song as usual during a benefit for Tibet at New York’s Carnegie Hall, but this time they were joined, on backing vocals, by none other than Iggy Pop. Depeche Mode frontman stunned the audience at a 2011 MusiCares fundraiser by launching into “Love Will Tear Us Apart.” Given his own group’s mastery of electronic darkness, Gahan’s version is fantastically gloomy. Art-alt supergroup Atoms for Peace is the side project of Radiohead frontman Thom Yorke and includes, on bass, the mighty Flea of the Red Hot Chili Peppers. ATP’s “Love Will Tear Us Apart” is an absolute highlight of the band’s live performances. New York art-metal outfit Swans scored an alternative radio and MTV 120 Minutes hit with their lighter-than-usual (for them) go at “Love Will Tear Us Apart.” It’s spooky. The revolving-member Canadian music collective Broken Social Scene recorded “Love Will Tear Us Apart” for the soundtrack of the 2009 film, The Time Traveler’s Wife. Their piano-driven take is bracing and outstanding.